I have been a student or practitioner of foreign policy for close to five decades now, from the time I was a college student through my fourteen plus years as CFR president. Debates over both the ends and means of American foreign policy have been commonplace. Yet for all the intensity of these disagreements, protagonists on all sides tended to share many of the assumptions about this country’s role in the world. Where they parted ways was on the wisdom of a specific course of action. I say this because for now this statement no longer pertains. There are few if any givens when it comes to free trade, alliances, the desirability of promoting democracy and human rights, support for international agreements and institutions, even American leadership itself. I have no idea whether this state of affairs is the new normal or a passing phase. But however long it lasts, it is sure to be consequential. My intent for this essay is not to discuss the causes or likely results of this new and much larger debate about the relationship between the United States and the world; that is better left to books and to the pages of Foreign Affairs. What I want to discuss, instead, are the implications for the Council on Foreign Relations. The short answer is that it will matter a great deal. As a result, our response must be equal to the situation. The one thing we cannot afford is business as usual. 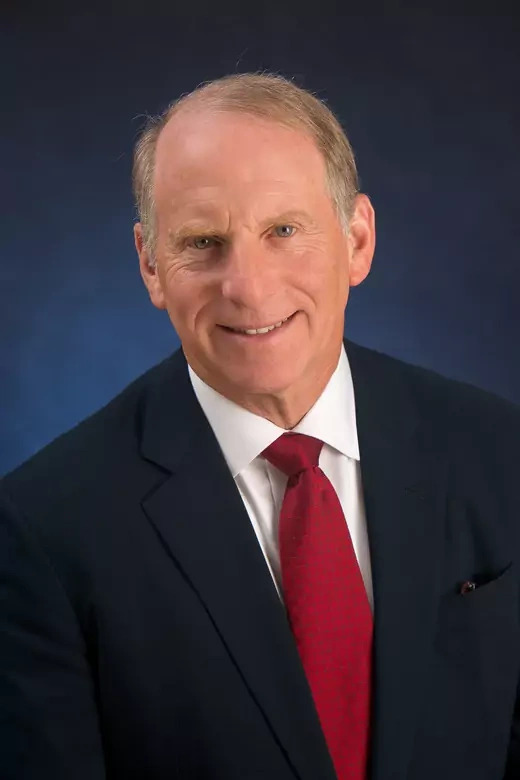 Richard N. Haass discusses the United States’ differing priorities on North Korea at the Korea Foundation for Advanced Studies in Seoul, South Korea. To begin with, we at CFR need to address rather than assume many of the perspectives that have informed U.S. foreign policy for decades. Take the issue of this country’s involvement in the world. A 2016 Pew Research poll revealed that a majority of Americans want this country to deal with its own problems and let others deal with theirs. A plurality of Americans think we are doing too much overseas. The drawback with this thinking is that American lives and livelihoods are affected by a world in which just about everything, from tourists and terrorists to carbon and viruses of every sort, flows across borders, affecting this country and its citizens in fundamental ways. We cannot become a gated community even if we wanted to. But that point needs to be made, not assumed. Second, CFR must reach out beyond current members. Council membership is just five thousand in a country of some 320 million. In recent decades, the Council has expanded its outreach to individuals and communities beyond its membership. We will continue to do this and more. Through efforts that connect CFR experts and resources with state and local leaders, religious leaders and traditions, academic institutions, and teachers and students, CFR is committed to reaching out to different constituencies so they can understand the world and the foreign policy choices facing the United States and other governments. Assistant Copy Editor and Writer Claire Felter speaks with a teacher about using CFR Backgrounders in the classroom during the College and University Educators Workshop. We need to address rather than assume many of the perspectives that have informed U.S. foreign policy for decades. Third, and consistent with the above, we must acknowledge that the educational system at the high school and college levels is often inadequate to the challenge. Too many Americans lack the global literacy they need to fully meet the demands of citizenship and the realities of economic competition. Many institutions do not teach geography, world history, foreign cultures, or world events, and if they do, they rarely require it for graduation. To help meet this need, the Council recently launched CFR Campus, a major initiative dedicated to promoting a higher level of knowledge and understanding of international affairs as well as the fundamental skills required to meet the challenges of the twenty-first century. CFR has debuted new educational products, beginning with Model Diplomacy, a National Security Council simulation that engages students to comprehend the challenges of shaping and implementing foreign policy, and it is in the process of producing foundational materials that can form a curriculum or supplement an existing one. JPMorgan Chase Institute CEO Principal Diana Farrell, Bernard L. Schwartz Senior Fellow Edward Alden, WilmerHale Senior International Partner Charlene Barshefsky, and former Representative Barney Frank (D-MA) consider the uncertainty facing U.S. trade. Fourth, we must harness emerging technologies. We have put great effort into digital communication, unveiling a user-friendly new iteration of CFR.org this spring and sharing more original content for consumption on social media so new audiences can find and use our resources. We are working to overcome the limits posed by geography so that members anywhere in the world can participate in the activities of the organization. American lives and livelihoods are affected by a world in which just about everything flows across borders. Fifth, but far from last, the Council must stay true to its core principles. One is nonpartisanship. CFR takes no institutional positions on matters of policy. We go to great lengths to ensure that our meetings, scholars, members, and those invited to write in our magazine represent a wide spectrum of opinions on foreign policy. We are no less committed to safeguarding our independence. We are not only transparent about our funding but also do not accept funding that compromises our ability to speak truth to power. NPR Counterterrorism Correspondent Dina Temple-Raston speaks with Sophos Next Gen Endpoint’s Anup Ghosh, Liberty Group Ventures’ Kiersten Todt, and CFR’s Adam Segal about the United States’ vulnerability to cyberattacks. The good news is that as a result of these undertakings and commitments, the Council is well positioned to maintain its status as the preeminent institution in this or any country dedicated to promoting enhanced understanding of U.S. foreign policy and the world. We have an increasingly diverse membership of men and women involved and informed; a talented, committed staff of more than three hundred; a proven, experienced, and engaged Board of Directors; landmark buildings in both New York and Washington; a world-class website; and the preeminent journal in the field. We can, and should, approach the end of our first century and the start of our second with confidence. U.S. Permanent Representative to the United Nations Nikki Haley explains the U.S. agenda for its term as president of the UN Security Council. 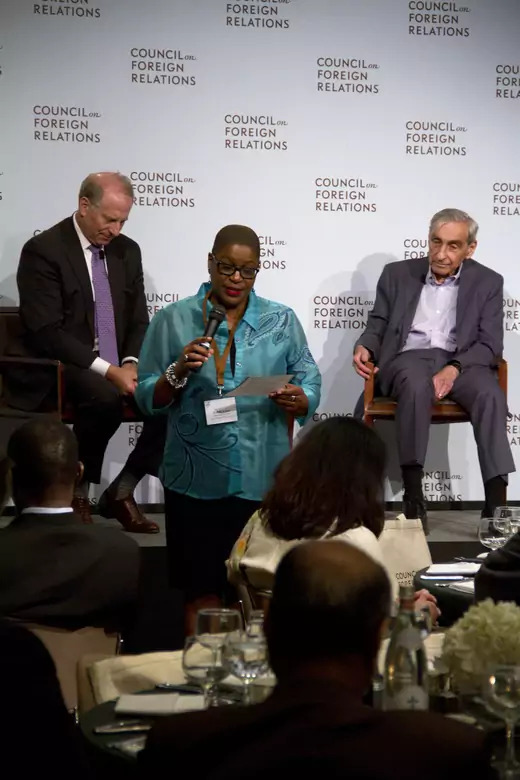 The Council on Foreign Relations serves an essential role as a nonpartisan forum for thoughtful and informed foreign policy debate, bringing members together with leaders in government and business along with experts from academia for discussions on critical issues in foreign policy and international relations. Vice President Joe Biden outlines his vision for U.S. leadership in global politics. This year, CFR welcomed dozens of foreign officials and current and former heads of state, including the presidents of Ukraine and Peru, the prime ministers of Italy and New Zealand, former Prime Minister of Australia Julia Gillard, former Prime Minister of the United Kingdom Tony Blair, Indian Finance Minister Arun Jaitley, the ministers of health of the Philippines and Barbados, and the foreign ministers of Iran, Afghanistan, Greece, and Argentina. Former UN Secretary-General Ban Ki-moon, UNESCO Director General Irina Bokova, Director General of the World Health Organization Margaret Chan, OECD Secretary- General Angel Gurria, and the European Central Bank’s Benoît Coeuré all addressed CFR members in New York or Washington, DC. Fareed Zakaria of CNN discusses U.S.-Iran relations with Iranian Foreign Minister Mohammad Javad Zarif. This year, CFR welcomed dozens of foreign officials and current and former heads of state. CFR also opened its doors to a number of U.S. officials, including U.S. Permanent Representative to the United Nations Nikki Haley, Federal Reserve Board of Governors Member Lael Brainard, Vice Chairman of the Federal Reserve Stanley Fischer, and from the Barack Obama administration, Vice President Joe Biden, Secretary of the Treasury Jacob J. Lew, Secretary of Energy Ernest J. Moniz, Secretary of Veterans Affairs Robert A. McDonald, Assistant to the President for Homeland Security and Counterterrorism Lisa O. Monaco, Chairman of the Council of Economic Advisers Jason Furman, Deputy Secretary of State Antony J. Blinken, Deputy Secretary of Energy Elizabeth Sherwood-Randall, Director of National Intelligence James Clapper, Director of the Central Intelligence Agency John Brennan, and Director of the Centers for Disease Control and Prevention Tom Frieden. Members also heard about the congressional national security task force from a panel of Republican congressional leaders, including Speaker of the House Paul Ryan and House Majority Leader Kevin McCarthy. Former U.S. Secretaries of Homeland Security Michael Chertoff and Jeh Johnson spoke at CFR, as did the five military service chiefs for the Robert B. McKeon Endowed Series on Military Strategy and Leadership. New York Times Washington Correspondent David E. Sanger presides over a debate on U.S. trade agreements at the annual Term Member Conference. 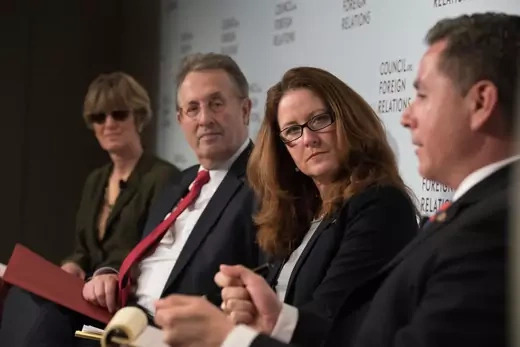 CFR hosted a number of meetings related to the transition and first months of the Trump administration, including panels evaluating the future of civil-military relations and the implications of the executive order restricting travel and immigration. The HBO-sponsored What to Do About … series—in which meetings mimic National Security Council sessions and speakers act as advisors to the president and advocate for their positions on complicated global issues—addressed Venezuela, Russia, trade, Syria, and North Korea. CFR’s new Lessons from History series, made possible by David M. Rubenstein, covered the foreign policy legacy of the Obama and Reagan administrations, the tenth anniversary of the Iraq surge, the state of intelligence fifteen years after the 9/11 terrorist attacks, the fiftieth anniversary of the Six Day War, and the hundredth anniversary of U.S. entry into World War I, as well as other topics. Director of National Intelligence James R. Clapper reflects on the lessons learned over his six-year tenure. 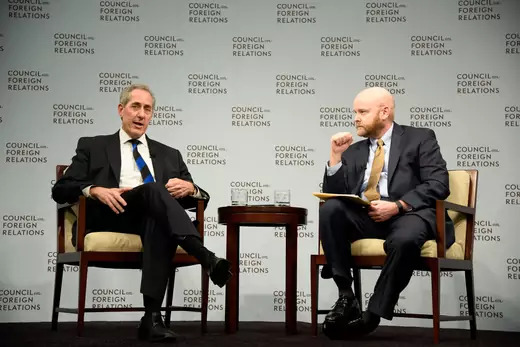 As part of the Daughters and Sons series, which invites CFR members to bring along their high school- and college-age children, CFR hosted former U.S. Trade Representative Michael Froman, former U.S. Permanent Representative to the United Nations Samantha Power, and former Secretary of State Madeleine Albright, as well as a panel on war reporting with recent Edward R. Murrow press fellows. The CEO Speaker series brought Gregory J. Hayes of United Technologies, Robert Greifeld of Nasdaq, Brian Moynihan of Bank of America, and Inge Thulin of 3M Company to address CFR. Ukrainian President Petro Poroshenko discusses the country’s ongoing struggle with separatists in eastern Ukraine. CFR hosted several multisession symposia this year, events that offered members a full-day exploration into topics such as the future of U.S. trade policy, women’s participation in conflict prevention and resolution, privacy and data in the age of surveillance, anticorruption, behavioral economics, and Russia and its relations with the West. Keynote speakers at these events included Chairman and Chief Executive Officer of General Electric Jeffrey R. Immelt, Nobel Laureate Daniel Kahneman, former U.S. Secretary of Commerce Penny Pritzker, and Senator Ben Cardin (D-MD). Former British Prime Minister Tony Blair discusses education and extremism with UN Educational, Scientific, and Cultural Organization Director General Irina Bokova. More than 350 term members attended the twenty-first annual Term Member Conference in Washington and participated in conversations on veteran integration, trade agreements, and the inbox of the Trump administration. CFR also hosted term member trips to the National Security Council, the National Museum of African American History and Culture, U.S. Southern Command and Joint Interagency Task Force South in Miami and Key West, U.S. Military Academy at West Point, and U.S. Naval Station Norfolk as well as a week-long trip to Mexico. 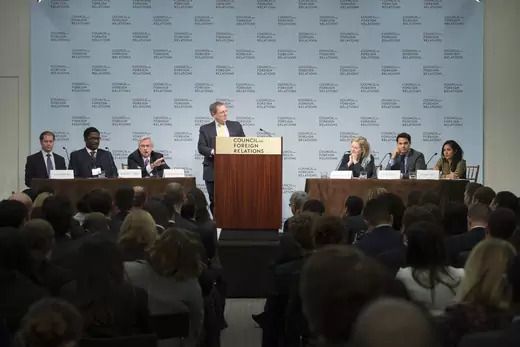 Finally, CFR hosted the fifth annual Conference on Diversity in International Affairs in April. The conference, a collaborative effort with the Global Access Pipeline and the International Career Advancement Program, aims to connect students and professionals from diverse backgrounds to career opportunities in international affairs. International House President and CEO Calvin Sims shares lessons from his formative career experiences during CFR’s Diversity in International Affairs Conference. Nearly 180 participants from around the world attended the second National Symposium in Menlo Park, California. The National Program connects CFR members who live outside New York and Washington, DC, with CFR and its resources. This past year, the National Program hosted roundtable discussions across the United States and in select cities abroad on the Zika virus, immigrant integration, mass surveillance and civil liberties, the self-proclaimed Islamic State, U.S. jobs and trade policy, policy options in Syria, and the future of U.S.-Russia relations. The National Program also held interactive conference calls and offered livestreams and teleconferences of CFR meetings in New York and Washington, DC. 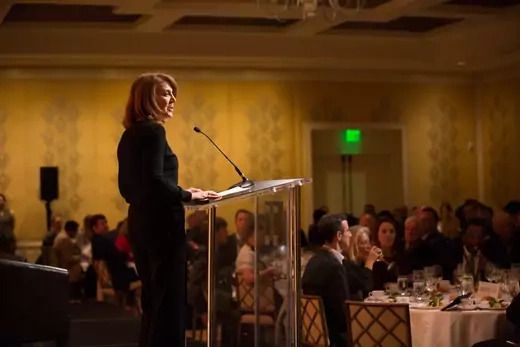 Ruth Porat, chief financial officer of Alphabet, Inc., addresses CFR’s National Symposium in Menlo Park, California. In December, nearly 180 participants from across the country and around the world attended the second National Symposium in Menlo Park, California, which featured discussions on big data and artificial intelligence, politics and business in China, and the relationship between technology, skills, and U.S. competitiveness. The year ended with the National Conference in New York, which convened more than five hundred participants for three days of panels and discussions, beginning with a keynote session with Secretary of Commerce Wilbur Ross. The conference continued with sessions on the rise of populism, U.S.-Russia relations, and the implementation of U.S. immigration policy, and featured conversations with UN Secretary-General Antonio Guterres and with former New York City Mayor Michael Bloomberg on climate change. BBC Anchor Laura Trevelyan and UN Secretary-General Antonio Guterres discuss how the United Nations is changing, at the National Conference in New York. CFR’s Corporate Program comprises more than 140 member companies from across the globe and offers business leaders access to a forum to interact with noted thinkers and practitioners in government, policy, and academia. This year, the program held meetings on trade, energy, financial sanctions, cybersecurity, and the impact of policy changes related to corporate taxes, among other issues. CFR also held conference calls to provide timely analysis to executives on current events, including the situation in Venezuela and the global ransomware attack. 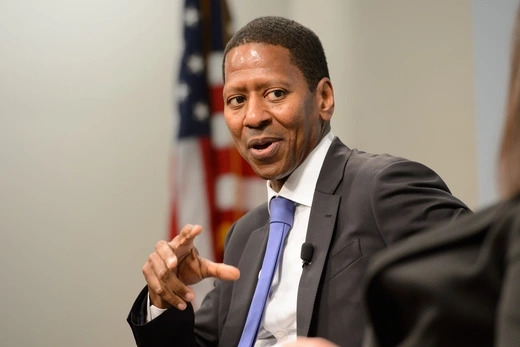 The annual Corporate Conference, held in early April, opened with a conversation with Dan Schulman, president and CEO of PayPal, and included panels on geopolitical risk, the global economy, and the future of work. PayPal President and CEO Dan Schulman discusses public-private partnerships at CFR’s Corporate Conference. CFR’s scholars and experts published seven books this year. The Man Who Knew: The Life and Times of Alan Greenspan, is a stellar biography of the former Federal Reserve chairman by Paul A. Volcker Senior Fellow for International Economics Sebastian Mallaby that received the 2016 Financial Times and McKinsey Business Book of the Year Award. In The Curse of Cash, Senior Fellow for Economics Kenneth S. Rogoff makes a case for getting rid of most paper money—a source for the underground economy and a liability to monetary policy—and offers a plan to address the issues this transition would pose. In Failure to Adjust: How Americans Got Left Behind in the Global Economy, Bernard L. Schwartz Senior Fellow Edward Alden argues that despite the deep partisan divisions over how best to respond to America’s competitive challenges, agreement can be achieved on overhauling tax rules, boosting graduation rates, investing in infrastructure, and streamlining regulations. Distinguished Fellow Michael Froman and Senior Vice President, Director of Studies, and Maurice R. Greenberg Chair James M. Lindsay discuss the future of international trade deals. CFR’s scholars and experts published seven books this year. CFR President Richard Haass’s book A World in Disarray: American Foreign Policy and the Crisis of the Old Order contemplates the history of world order from the rise of the modern state system to the end of the Cold War, accounts for the momentous shifts in the last quarter century to shed light on the current state of affairs, and outlines specific steps to tackle the many challenges ahead. Senior Fellow for Southeast Asia Joshua Kurlantzick’s book, A Great Place to Have a War: America in Laos and the Birth of a Military CIA, tells the story of how the United States’ secret war in Laos in the 1960s and 1970s transformed the CIA from a loose collection of spies into a paramilitary operation. In False Dawn: Protest, Democracy, and Violence in the New Middle East, Steven A. Cook, Eni Enrico Mattei senior fellow for Middle East and Africa studies, explains why, more than half a decade after people across the Middle East poured into the streets to demand change, hopes for democracy in the region have receded, replaced by violence and renewed state repression. Additionally, Foreign Affairs Managing Editor Jonathan Tepperman released The Fix: How Nations Survive and Thrive in a World in Decline, which identifies ten seemingly insurmountable challenges from around the world—including immigration reform, economic stagnation, political gridlock, corruption, and Islamic terrorism—and shows at least one instance in which each has been successfully addressed. 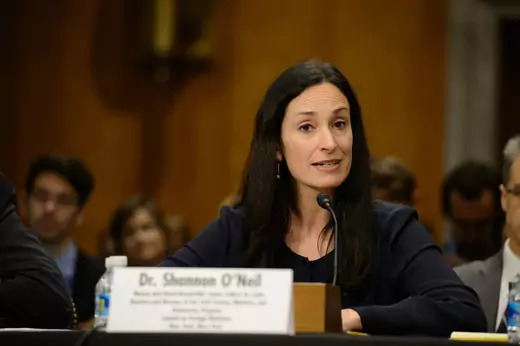 Nelson and David Rockefeller Senior Fellow for Latin America Studies and Director of the Civil Society, Markets, and Democracy Program Shannon K. O’Neil testifies on Venezuela before the Senate Committee on Foreign Relations. In Council Special Reports, experts provide timely responses to developing crises or contributions to current policy dilemmas. In one such report, Repairing the U.S.-Israel Relationship, Senior Fellows Robert D. Blackwill and Philip H. Gordon propose steps the president should take to fix relations between the two countries, including a genuine high-level strategic dialogue that focuses on Iran and a host of existing and potential political and military contingencies. In Ending South Sudan’s Civil War, Kate Almquist Knopf of the Africa Center for Strategic Studies argues for an international transitional administration, established by the United Nations and the African Union, to run South Sudan. In Rebuilding Trust Between Silicon Valley and Washington, Ira A. Lipman Chair in Emerging Technologies and National Security Senior Fellow Adam Segal examines the security risks exacerbated by the divide between government and the technology community and offers policy recommendations to help restore trust. In Reducing Tensions Between Russia and NATO, Kimberly Marten of Barnard College recommends that, in order to deter Russian aggression, the U.S. government should reaffirm its commitment to NATO, sustain troop deployments, publicize deterrent capabilities, and encourage NATO to think about measures that would raise costs for a Russian attack. Paul A. Volcker Senior Fellow for International Economics Sebastian Mallaby talks about his new biography, The Man Who Knew: The Life and Times of Alan Greenspan. In Policy Innovation Memoranda, senior fellows target critical global problems where new, creative thinking is needed. Jeane J. Kirkpatrick for National Security Studies Senior Fellow Max Boot and Michael Miklaucic of the National Defense University suggest in “Reconfiguring USAID for State-Building” that the U.S. Agency for International Development should take the lead in fostering better-functioning institutions in chaotic countries. In “Reforming the U.S. International Military Education and Training Program,” Kurlantzick details how this program, which funds members of foreign militaries to take classes at U.S. military facilities, should be reformed before it is enlarged. 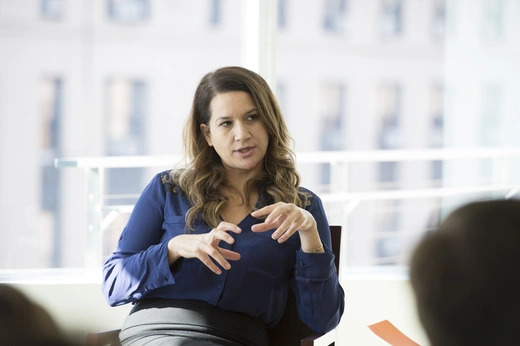 In “Closing the Gender Gap in Development Financing,” Douglas Dillion Senior Fellow Rachel B. Vogelstein contends that the United States should lead the effort by spearheading the creation of a pool of funds to be used to support gender equality measures. Edward R. Murrow Press Fellow Leila Fadel speaks to term members. In Contingency Planning Memoranda, experts address plausible short- to medium-term contingencies that could seriously threaten U.S. interests. In “A Cyberattack on the U.S. Power Grid,” Whitney Shepardson Senior Fellow Robert K. Knake recommends steps the United States should take to prevent such a cyberattack and to mitigate the potential harm should preventive measures fail. In “Renewed Conflict Over Nagorno-Karabakh,” Carey Cavanaugh of the University of Kentucky argues that the conflict could jeopardize U.S. interests in the region and recommends that the U.S. government collaborate with Russia to energize the Minsk Group peace process and use preventive measures to deter military action. 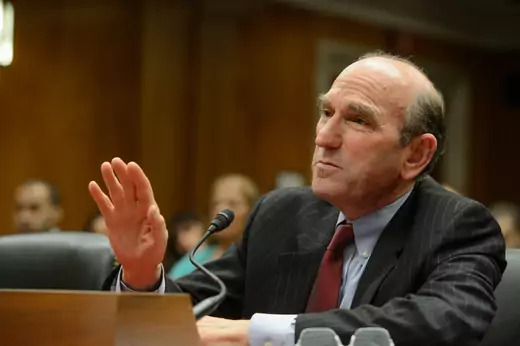 Senior Fellow for Middle Eastern Studies Elliott Abrams testifies about aid to Egypt before the Senate Committee on Appropriations’ subcommittee on state, foreign operations, and related programs. The Center for Preventive Action’s annual Preventive Priorities Survey evaluates ongoing and potential conflicts based on their likelihood of occurring in the coming year and their effect on U.S. interests. For 2017, foreign policy experts ranked a serious military confrontation between Russia and a NATO member state or a major crisis in North Korea among their top international concerns. A new Sovereign Risk Tracker developed by Senior Fellow Benn Steil gauges the vulnerability of emerging markets to default on external debt. Greece, Ukraine, and Venezuela were identified as the three countries most at risk of defaulting. CEO of MAC Energy Advisors Tracy B. McKibben, the DOE’s Solar Energy Technologies Office Director Charlie Gay, Greentech Media Senior Vice President Shayle Kann, and Philip D. Reed Fellow for Science and Technology Varun Sivaram discuss clean energy. The think tank welcomed several new fellows this year, including former U.S. Trade Representative Michael Froman, who works on trade and investment policy, technology, globalization, and populism; Charles A. Kupchan, a returning fellow who was most recently special assistant to the president and senior director for European affairs on the staff of the National Security Council, and whose work at CFR focuses on transatlantic and European affairs; Ely Ratner, former deputy national security advisor to the vice president, who joined as the Maurice R. Greenberg senior fellow in China studies, working on Asian security issues; and Lori Esposito Murray, president emerita of the World Affairs Councils of America, who joined as an adjunct senior fellow working on chemical, biological, and nuclear weapons issues. Jay Winik, best-selling author of April 1865: The Month That Saved America and 1944: FDR and the Year That Changed History, joined CFR as its first historian-in-residence, and spent the year looking at history with an eye toward drawing lessons for today’s policymakers. This year, the Council of Councils (CoC), a consortium of policy institutes around the world that discusses major issues in global governance, held meetings in Berlin and in Washington, DC. The group also released its annual Report Card on International Cooperation, which evaluated global efforts in 2016 on ten issues. The group gave international cooperation an overall grade of C–, a downgrade from last year’s B, and rated interstate conflict, terrorism, and internal violence as the most pressing challenges. A full list of CoC members can be found here. James H. Binger Senior Fellow in Global Governance and Director of the International Institutions and Global Governance program Stewart M. Patrick and South African Institute of International Affairs CEO Elizabeth Sidiropoulos discuss globalization. CFR’s Independent Task Force Program convenes diverse and distinguished groups of experts who offer analysis of and policy prescriptions for major foreign policy issues facing the United States. The Task Force on U.S. policy toward North Korea was co-chaired by retired Admiral Mike Mullen, former chairman of the Joint Chiefs of Staff, and former Senator Sam Nunn (D-GA), co-chairman and chief executive officer of the Nuclear Threat Initiative, and directed by former CFR Stanton Nuclear Security Fellow Adam Mount. The Task Force found that the United States’ policy of strategic patience with North Korea will neither halt that country’s recurring and dangerous cycle of provocation nor ensure the stability of Northeast Asia in the future. The Task Force’s report, A Sharper Choice on North Korea: Engaging China for a Stable Northeast Asia, proposes ideas to expand regional dialogue, work closely with China, restructure negotiations, strictly enforce new sanctions authority, and deter and defend against a regime that poses a steadily increasing threat. 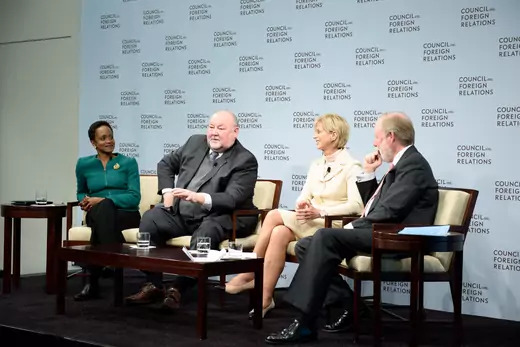 Executive Director and CEO of NAFSA Esther Brimmer, former Coast Guard Admiral Thad W. Allen, and former EPA Administrator Christine Todd Whitman discuss the U.S. strategic presence in the Arctic with LA Times Washington Columnist Doyle McManus. An Independent Task Force on U.S. strategy in the Arctic, co-chaired by retired Admiral Thad W. Allen, former commandant of the U.S. Coast Guard, and Christine Todd Whitman, former administrator of the Environmental Protection Agency, and directed by Esther Brimmer, former CFR adjunct senior fellow for international institutions, concluded its project in March. The Task Force’s report, Arctic Imperatives: Reinforcing U.S. Strategy on America’s Fourth Coast, proposes specific actions to improve the United States’ strategic presence in the Arctic, including bolstering infrastructure investment, defending national borders, protecting the environment, and maintaining U.S. scientific and technological leadership. In September, CFR released the results of the Global Literacy Survey, undertaken in partnership with National Geographic. The survey measured how much (or, in many cases, how little) students educated at American colleges and universities know about the world. The results reveal significant gaps between what young people understand about today’s world and what they need to know to successfully navigate it. CFR’s work in education aims to address these gaps. 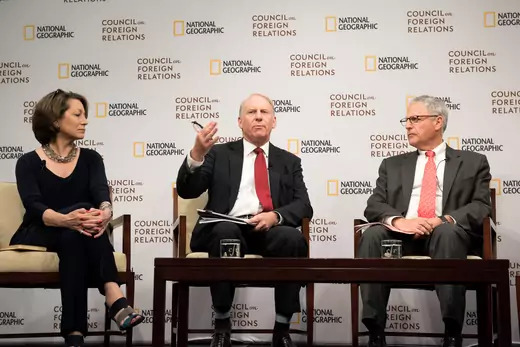 National Geographic Editor in Chief and National Geographic Partners Editorial Director Susan Goldberg, CFR President Richard N. Haass, and National Geographic Society President Gary E. Knell highlight the gaps revealed by the Global Literacy Survey. CFR’s first educational product, a multimedia National Security Council simulation program called Model Diplomacy, marked its one-year anniversary in January. Since the launch of the simulation in early 2016, more than thirteen thousand students and instructors from more than eleven hundred public and private colleges, community colleges, universities, and high schools in nearly ninety countries and forty-seven states and territories have registered to use the program and its fourteen cases. CFR serves as a forum for educators and students to interact with CFR experts over discussions on foreign policy. In addition to providing educational resources, CFR serves as a forum for educators and students to interact with CFR experts and each other over discussions on a host of issues in foreign policy and international relations. This academic year, more than 135 universities and high schools participated in the Academic Conference Call series, a biweekly teleconferenced discussion between students and a CFR expert. Calls covered U.S.-Russia relations, the future of U.S.-Cuba relations, U.S. trade policy, and cyber governance. Middlebury Professor Allison Stanger, Wilson Center Fellow Earl Anthony Wayne, University of New Hampshire Associate Professor Alynna J. Lyon, and U.S. Military Academy professor Brandon J. Archuleta discuss using CFR’s Model Diplomacy simulation. The annual Higher Education Working Group brought more than sixty heads of colleges and universities to CFR for sessions on U.S.- Russia relations, the rise of China, and globalization and the drivers of inequality. In April, college and university professors representing 122 public, private, and community colleges from thirty-eight states attended the sixth annual College and University Educators Workshop to learn about CFR and discuss best practices for teaching international affairs. In addition to panels on U.S. immigration policy, the future of the Middle East, and the challenges of the emerging Arctic, the workshop featured a session with professors who have used Model Diplomacy, as well as discussions on bringing global issues into the classroom. CFR’s annual Back-to-School Event introduced undergraduate and graduate students and professors to CFR’s vast array of resources. United Church of Christ’s Minister for Racial Justice Velda Love (middle) delivers a blessing at the Religion in Foreign Policy Workshop before a conversation with Richard N. Haass and Professor Emeritus at the Institute for Advanced Study Michael Walzer. Since 2006, CFR’s Religion and Foreign Policy Initiative has provided a forum in which to deepen the understanding of issues at the nexus of religion and U.S. foreign policy through meetings, conference calls, and an annual workshop. This year, the initiative held roundtables and conference calls on timely topics, including the Syrian refugee crisis, U.S.-Israel relations, countering violent extremism, the persecution of religious minorities around the world, and the intersection of religious freedom and women’s rights. In May, the eleventh annual Religion and Foreign Policy Workshop brought together 129 congregational and lay leaders, religion scholars, and representatives of faith-based organizations from thirty-seven religious traditions. Participants heard from Michael Walzer on just war theory and from experts on the resurgence of religious practice in China, the rise of nationalism and the future of liberal democracy, and the juxtaposition of pluralism and polarization in the United States. The conference also included discussion groups on the advancement of women and girls, the global migration and refugee crisis, racial and ethnic inequality, and nuclear nonproliferation and disarmament. CFR serves as an essential source of independent, nonpartisan analysis to inform policymakers and the foreign policy debate. During the 114th Congress, CFR fellows were called to testify thirty times. This past year, the Congress and U.S. Foreign Policy program held fifty-five bipartisan, bicameral roundtables and more than one hundred and sixty briefings, bringing together CFR experts with members of Congress and their staff. CFR fellows and staff have also been a resource for executive branch officials, briefing officials from the Departments of State, Defense, and Treasury, the Office of the Vice President, the National Security Council staff, the Office of the U.S. Trade Representative, USAID, and the Council of Economic Advisers. Time and Fortune’s Alan S. Murray presides over a conversation on the president’s inbox with CFR’s Thomas E. Donilon, CFR and Kissinger Associates’ Jami Miscik, and Harvard Kennedy School’s David R. Gergen as part of the Higher Education Working Group. Members of the Congressional Foreign Policy Study Group—a selective program that offers senior level congressional staff an opportunity for in-depth, focused examination of critical foreign policy topics—traveled to New York in September to attend CFR meetings and meet with CFR and Foreign Affairs experts. In March, CFR hosted the fifth biennial Congressional Staff Conference, a day-long program bringing CFR members and experts together with senior congressional staff to discuss issues including the future of NATO, cybersecurity challenges confronting Congress, the future of U.S.-China relations, and efforts on countering violent extremism. CFR launched a redesigned website in May, transforming the site’s look and performance and elevating CFR.org to the level of the websites of much larger businesses and media organizations. The new website offers a vastly improved user experience, particularly in navigating and discovering content throughout the website. CFR’s redesigned website continues to provide timely foreign policy analysis. Throughout the redesign, CFR continued to provide timely foreign policy analysis to the public through its online products. The website hosts numerous Backgrounders, Expert Briefs, interviews, and explainers, responding quickly to current events with up-to-date analysis and data-rich resources on topics such as trade, the Islamic State, the conflict and peace process in Colombia, the U.S. immigration and refugee system, North Korea’s military capabilities and the China-North Korea relationship, U.S.-Saudi relations, NAFTA, and NATO. The interactive InfoGuide series expanded with an edition on the deforestation of the Amazon. The Emmy-nominated guide showcases new immersive multimedia features including sound design, an aerial video, and a dynamic map. The website became a sought-after destination for audiences interested in the foreign policy consequences of the U.S. presidential election. The Campaign 2016 microsite, launched at the end of 2015 to help compare candidates’ positions on foreign policy issues, evolved to Transition 2017, which focused on the foreign policy positions of President Trump and presented analysis on policy challenges facing the incoming administration. The combined Campaign 2016 and Transition 2017 iterations of the website included a series of short, animated videos that examined some of the complex policy challenges that would greet the new president, including China, trade, immigration, the Islamic State, and climate change, and attracted an impressive amount of traffic. To tap into public interest in the elections, CFR launched a successful podcast series, The President’s Inbox, after Election Day. Hosted by Director of Studies James M. Lindsay and CFR.org Managing Editor Robert McMahon, the podcast provides a weekly review with experts on the top foreign policy and national security priorities facing the Trump administration. Seventeen blogs by CFR fellows provide timely analysis of important foreign policy and international relations events. Additionally, CFR maintains a significant presence on social media, broadcasting livestreams of CFR meetings and reaching hundreds of thousands of followers on Facebook, Twitter, and YouTube.